In a medium saucepan, add in the sugar, cornstarch, and salt. Stir to combine. This will incorporate the cornstarch and prevent lumps. Add in the strawberry puree and lemon juice. Stir until combined. Place saucepan over medium heat and let come up to a boil. You'll want to let it boil for two minutes. Add your egg yolks to a small bowl. Whisk together. Add about 1/2 cup of the boiling strawberry mixture into the eggs and immediately whisk. This will temper the eggs so they won't cook when you pour them into the boiling mixture. Pour the tempered yolks into the saucepan while whisking constantly. Let the curd come back up to a boil and let boil for five minutes until thickened. Stir often/if not constantly to avoid burning. Place a fine mesh strainer over a bowl. Remove the saucepan from the heat and pour the curd into the strainer. Strain out any cooked pieces of egg. Cover the curd with plastic wrap. Be sure to have the plastic wrap sitting on the top of the curd to avoid a skin forming and immediately place into the fridge to chill. Preheat oven to 350 degrees. Spray cupcake tin with non-stick cooking spray. In a large mixing bowl, add in the butter, shortening, and sugar. Beat on medium until incorporated. Add in the eggs and vanilla extract. Beat on medium until the eggs are thoroughly incorporated. Add in the flour, baking powder, salt, and cornstarch. Beat on low until most of the flour is worked into the dough. Turn mixer on medium and finish beating the cookie dough until all of the flour is incorporated. Using a medium cookie scoop, scoop the dough into each cavity. Place into the oven and let bake for 22 - 24 minutes or until done. Remove from the oven. Using a medicine cup or spoon, press the center of each cookie down while it's hot out of the oven. Let the cookies cool completely. Turn the pan over and give it a few gentle taps to remove the cookie cups. Add the curd into a sandwich bag. Cut the corner out of the sandwich bag. Fill each cookie with the curd. Serve them up or store them in the fridge. 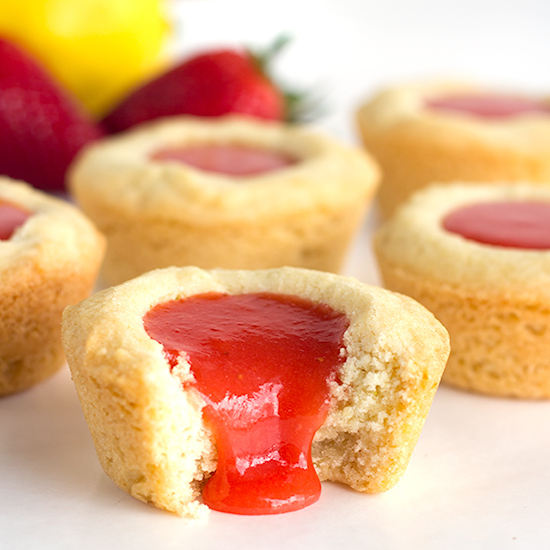 Strawberry Lemon Sugar Cookie Cups - tender sugar cookies baked in a cupcake tin. 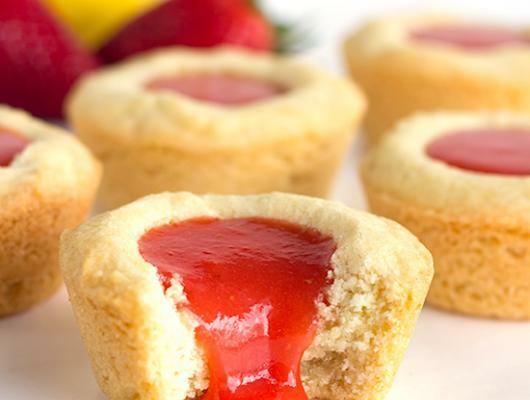 They're filled with a sweet and tangy strawberry lemon curd and make the perfect summertime cookie!